England midfielder coudl be set for extended stay in the French capital. 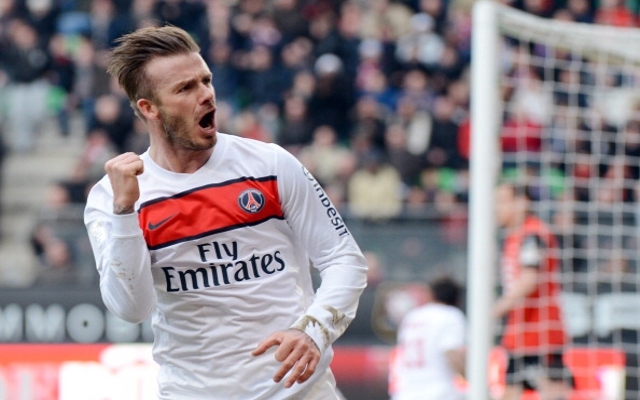 David Beckham has confirmed that PSG has asked him to stay at the club for another season, according to Sky Sports. The former England captain joined the club on the last day of the January transfer window on a free transfer after his contract expired with MLS side LA Galaxy in November. There were some suggestions that Beckham may have joined the Qatari backed side for one last payday before he retires but Beckham has hit back at those critics by donating all of his salary at PSG to a children’s charity and playing a key role in the club’s end of season run in. Beckham has won praise from his manager Carlo Ancelotti and team mate, Swedish striker Zlatan Ibrahimovic, for his attitude and professionalism since joining the club and it appears the player could be set to remain in Paris for another season. ‘My contract does end after this season. People have asked if I am going to continue to play, if I am going to continue to play here,’ said Beckham. ‘The owners, and the manager, have made it very clear they would like me to stay here and I am touched and honoured by that. ‘When you join a club sometimes it takes time to bed in and get that relationship with the players, the staff and the fans, but thankfully it has happened pretty quickly here in Paris, and it has been an amazing time so far and one that is going to continue. ‘I am enjoying this season so far and will enjoy it until the end of the season, hopefully we will be successful and then I will make a decision on what I do. Beckham revealed that he currently has no intention of retiring and is keen to add some more trophies to his cabinet. The former Manchester United star was recently the last remaining Englishman in the Champions League before Barcelona knocked PSG out in the quarter final stages.